Children’s books have a long history of portraying hopeful tales of adventure and survival through fictional characters and fantastical worlds. Phasmid, however, is of a different nature. A true story told through lyrical words and unique illustrations, this picture book is as informative and fascinating as it is beautiful. Written by Rohan Cleave, invertebrate zookeeper at Melbourne Zoo, and illustrated by Coral Tulloch, artist and children’s illustrator who has previously collaborated with the likes of Alison Lester, this narrative is a treat for children and adults alike. It is the story of the Lord Howe Island Stick Insect and how it returned from the terrifying brink of extinction. Also named ‘phasmid’, based on the order of insects that it belongs to, this animal was once endemic to Lord Howe Island. That is, until the hungry rats accidentally introduced by Europeans in 1918 feasted on the species until they were thought to be completely extinct. It was not until 2001 that a scientific expedition to Balls Pyramid – a sea stack south-east of Lord Howe Island – revealed that a small population of the phasmids was alive and well. However, scientists knew that this tiny group of less than 30 was going to need a lot of help if they were to continue surviving. It is this incredible tale of a Lazarus species that Rohan tells in Phasmid: Saving the Lord Howe Island Stick Insect, narrated by the insects themselves as they explain their very literal return from the dead. Being fortunate enough to speak with Rohan in person, I had many questions to throw at him regarding why he chose to utilise children’s literature as a means of communicating this almost unbelievable story. With plenty of misinformation being spread when it comes to the natural world, Rohan makes it clear that the aim of his book was education, and that through the use of both words and art, he hoped to make a difference: ‘For me, the imagery of children’s books… is so pure and so beautiful. Right from the start, I wanted art involved in this, because there is something really moving about art… that can get a message across, [as well as] the truth… I didn’t want just fact and fact and fact.’ The conservation work for this species is currently taking place at Melbourne Zoo, and Rohan makes clear how he was passionate about ‘get[ting] the story out about how important Melbourne Zoo has been in this story as well.’ Without them, there may not have been such a tale of hope to tell about this fantastic creature. Rohan highlights the necessity of such survival stories in the wider context of conservation across the globe. He explains how he wanted to not only tell the story of the insect itself, but also ‘pay credit…to small teams of people’ by revealing what can actually be achieved with a great amount of hard work and optimism. Surely one of the most amazing moments for those working with the phasmid was when Yarra, the first Lord Howe Island Stick Insect to be born in captivity, hatched on 7 September 2003 – also known as Threatened Species Day in Australia, marking the date that the last Tasmanian Tiger died at Hobart Zoo. Rohan explains how himself and other team members were ‘…checking every morning and the afternoon, [and] were as shocked as anyone else when this little green nymph came out.’ It was the perfect day to celebrate the revival of such a unique species that was once thought to be lost forever. As demonstrated by Coral’s vivid illustrations, phasmid nymphs are born an incredibly bright green and only later, after moulting their exoskeleton many times, do they change from green to brown and then eventually to black. Describing illustrator Coral Tulloch as ‘a treasure’, it is clear that Rohan admires her not only for her amazing work as an artist, but also for her passion for connecting with children through the medium of illustration: ‘[It was] a very positive collaboration… The illustration on the front [of the book] was one that was really important to me to get.’ Coral did just that, producing an eye-catchingly unusual front cover, as well as accurate yet extraordinary works of art throughout. A juvenile Lord Howe Island Stick Insect. Image: Rohan Cleave / Melbourne Zoo. However, invertebrate conservation is a notoriously difficult endeavour to communicate to the public, who are often more interested in Australia’s furry and feathered friends. It was indeed a challenge for Rohan, as he explains: ‘Those of us that are converted think that [the phasmids] are [cute and cuddly],’ whereas there are naturally many who do not agree. It has therefore been important for Rohan and others involved in the phasmid program to establish a connection not only between themselves and the insects, but between the insects and the general public. Prior to the writing of Phasmid, Rohan asked himself, ‘How could I get people to connect?’ The result was a video that he produced of the hatching of a tiny phasmid nymph that has since gone viral, racking up an impressive three million views by people from all corners of the globe. Unsurprisingly, Rohan and Coral’s work is also now available globally, making Rohan proud to say that it is not a story of just one animal – it is representative of ‘every species on the planet’ and of the idea that ‘we’re responsible for passing something better on than what we’re leaving behind.’ By coupling an imaginative narrative with a more detailed explanation of the work done for the species (included at the end of the book), both Rohan and Coral have successfully created a beautiful work of literature and art. Rohan admits that the media has been incredibly supportive since the arrival of Adam and Eve – the first breeding pair to come from Balls Pyramid to Melbourne Zoo. Furthermore, Rohan tells me that the largest media presence he has ever seen at the zoo was the day that Sir David Attenborough himself went out of his way to visit the butterfly house – and ‘the only animal he wanted to see on the day was the Lord Howe Island Stick Insect.’ This in itself says enough about the global significance of just one little invertebrate. A phasmid nymph hatching. Image: Rohan Cleave / Melbourne Zoo. Perhaps most importantly, this book conveys what Rohan describes as a ‘story of hope’ and the importance of never giving up: ‘I always think that the only messages we can put out are messages of hope. It is never too late.’ I could not agree more. Visit Melbourne Zoo’s website for more information on this indefatigable invertebrate. 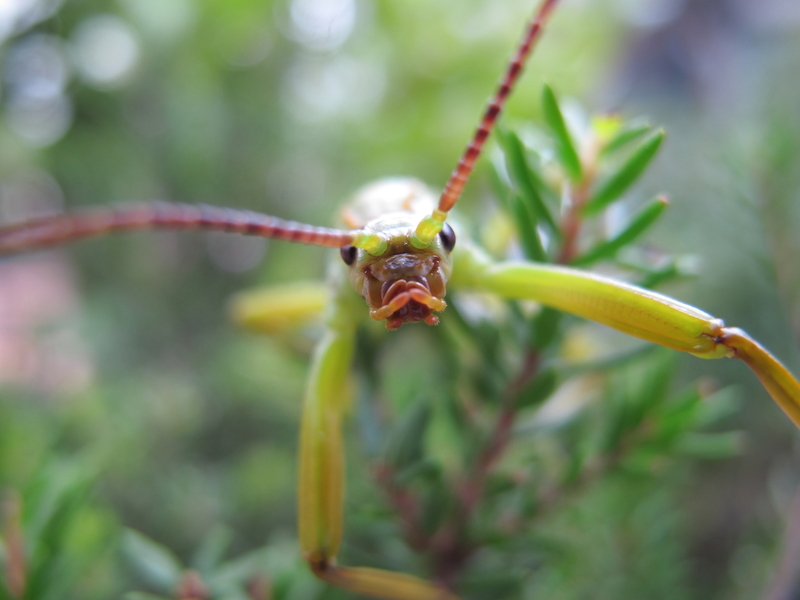 Purchase your copy of Phasmid: Saving the Lord Howe Island Stick Insect from CSIRO Publishing. Banner image of Lord Howe Island courtesy of Rohan Cleave / Melbourne Zoo. Suburban wilderness: the Langwarrin Flora and Fauna ReserveMaking a killing: where to for fox and cat control?